Wow, fantasy football season about to begin? That sure came up quick. 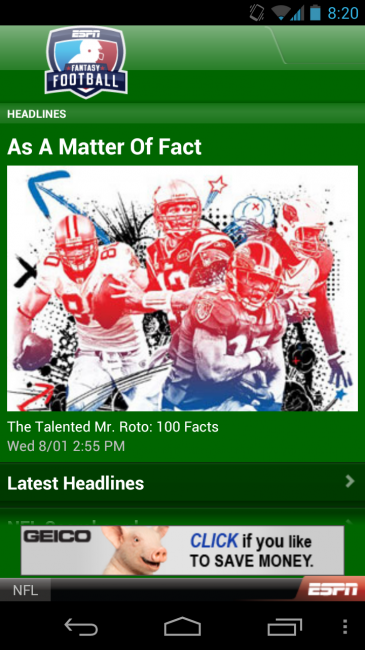 If you have already joined leagues on ESPN or are planning to, the ESPN Fantasy Football app is your best friend, especially now that it has been updated for the 2012 season. With this sucker on your phone, you really don’t even need to visit the web interface for your league, as it is about as fully featured as you’ll find. The massive ad at the bottom is a bit much, but the app is free. How many leagues have you joined/created already? Did you realize that the first preseason game was last night? And in case you were wondering, we will be doing another elimination group.